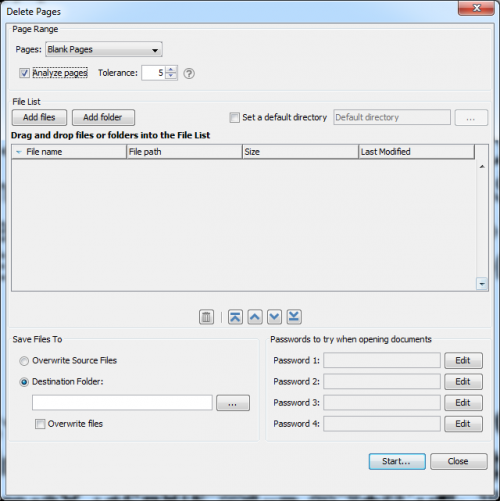 Q: How can I remove all the empty pages in a PDF document? Go to Document -> Rearranges Pages -> Delete Pages. Check “analyze pages” to set tolerance option. This will include pages that are not totally blank such as scanned pages that are a bit dirty, grayish or with smudges, based on the tolerance / tolerance attribute. 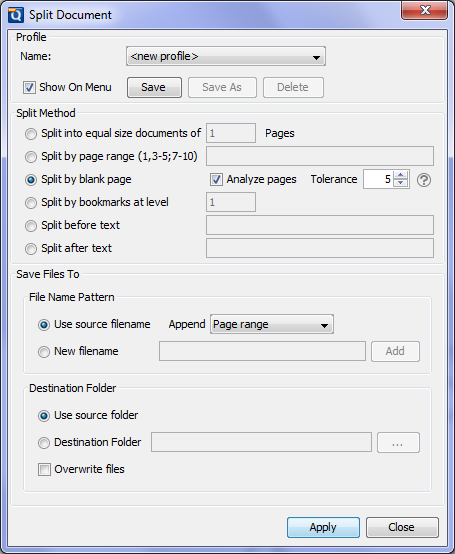 Read more in PDF Studio user guide about splitting PDF documents by blank pages. Go to Batch -> Document -> Delete Pages. 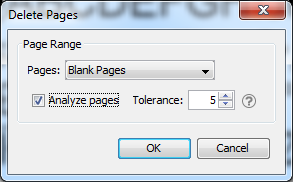 Check “analyze pages” to set tolerance option. This will include pages that are not totally blank such as scanned pages that are a bit dirty, grayish or with smudges, based on the tolerance / tolerance attribute. Add files/folder, select destination folder and click Start button. In PDF Studio 11 and below, there’s no specific function in PDF Studio to remove/delete blank pages from a PDF document but it is possible to do so by first splitting the PDF document by blank page and then merge the split documents back into a single PDF. Note that PDF Studio will preserve all the original content (in vector format including all fonts and shapes) contained in the original PDF document and pages, it will not simply convert the pages to images. – Check “analyze pages” to set tolerance option. This will include pages that are not totally blank such as scanned pages that are a bit dirty, grayish or with smudges, based on the tolerance / tolerance attribute. 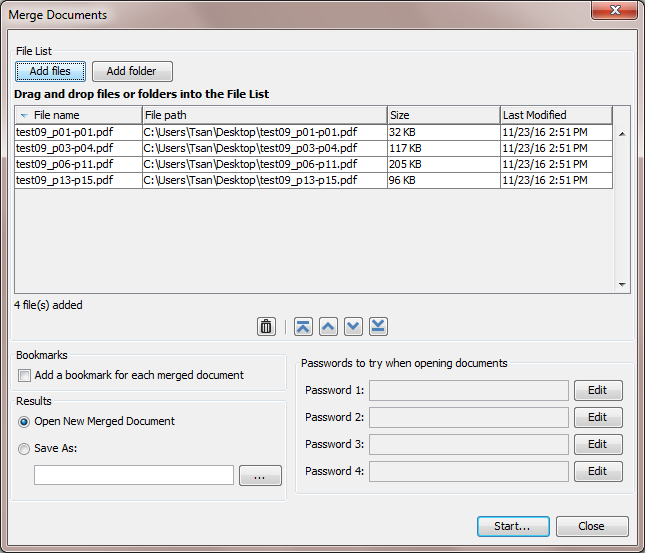 Read more in PDF Studio user guide about splitting PDF documents by blank pages. You can merge the split PDF documents to recreate the original PDF without blank pages by either using the Batch function or using Drag and Drop.